This four-volume work by Gustav Friedrich Waagen (1794-1868), edited and translated by Lady Eastlake (1809-93), was published between 1854 and 1857. As Waagen explains in his preface to the first volume, he had previously published an account of his experiences on his first visit to Britain in 1835, but this new and longer work was addressed primarily to a British audience. It also differs in that the earlier work was more of a general travelogue, whereas these volumes, after an introductory essay, provide a more detailed catalogue - albeit in epistolary form - of works of art in public and private collections. Waagen was crucial to the adoption in Britain of the new approach to art history pioneered by German scholars, and his work is still consulted on matters of provenance and quality. 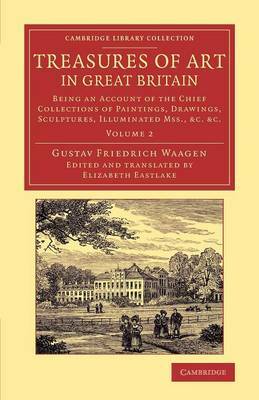 Volume 2 describes the artworks in Buckingham Palace, Apsley House and other private collections in London.